DO YOU SHOP AT NUGGET? 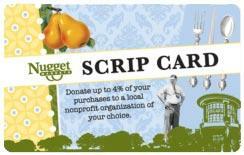 Sign up for a scrip card! 4% back to Breen. Please complete the Google Form and the Card will be delivered to your student(s) class. After you receive a card, visit https://scrip.nuggetmarket.com/ to sign up for an account. Don’t forget to bring your card with you every time you shop! WE KNOW YOU SHOP AT AMAZON? DO YOU SHOP AT SAVEMART? Use your card or registered phone # every time you shop. Earn 3% back to Breen! Donations can be made via PayPal links below. *PLEASE INCLUDE YOUR STUDENT(S) & TEACHER(S) NAME IN THE NOTES SECTION. GOAL PER FAMILY = SILVER. WHY ATTEND A PTC MEETING? We appreciate all of your donations and hope you will take advantage of all the Breen PTC Sponsored Events. Your family will be included on our special Recognition Wall for your helpful donation! Every bit helps!